1 What Causes Human Hair to Turn Gray? Hair usually turns white with age because over time, the follicles' melanin pigment supply depletes. When and to what extent your hair will turn shades of gray, white or silver varies and may depend on genetics. Just as people are often born with their parent's hair color palette, they may also inherit their graying patterns. Other reasons for hair turning white include malnourishment, injury or disease. In most cases, white hair does not return to its original color, as there is still no scientifically proven method of reviving the follicle's melanin production. People cope with the loss of hair color by reviving it with a dye that flatters their new hair. One can age gracefully by accepting his new shade and dying hair white, gray, silver or a combination of these colors. Hair usually turns white gradually, so hair may contain multiple tones already, including your original color. Since the hair is progressively becoming lighter, adopting shades of gray sooner than later will make the natural transition to white (should you be headed there) less dramatic. Highlights strands of hair throughout the head is a good idea if your hair is turning white because the regrowth will be less obvious. The color and intensity of highlights vary, but they are always lighter than your natural color. Scattered highlights can also blend away the white hairs if done a few shades lighter than your original color, according to MotherNature.com, a natural remedies website. Recoloring hair involves using a colored dye evenly over the entire head. Should you choose to keep your own natural color (if you had light hair before), the dye should be specially formulated for gray hair, since white hair's texture is more coarse and color resistant than pigmented hair is. If your hair is naturally dark, you will want to bleach or lighten the overall hair before dying it a lighter color. You should consult with a color specialist when making this transition from dark to light. Avoid red dyes that can turn white hair shades of pink, according to Haircut Advice and stick to light colors only. Many women dye their hair blond because, like highlights, it decreases the contrast between new white hairs and the rest of the hair. If you have naturally dark hair, this change will require bleaching agent and toner. A professional colorist is recommended because of the degree of processing. A stylist can also help you choose the appropriate blond hue for your skin color and natural hair color. 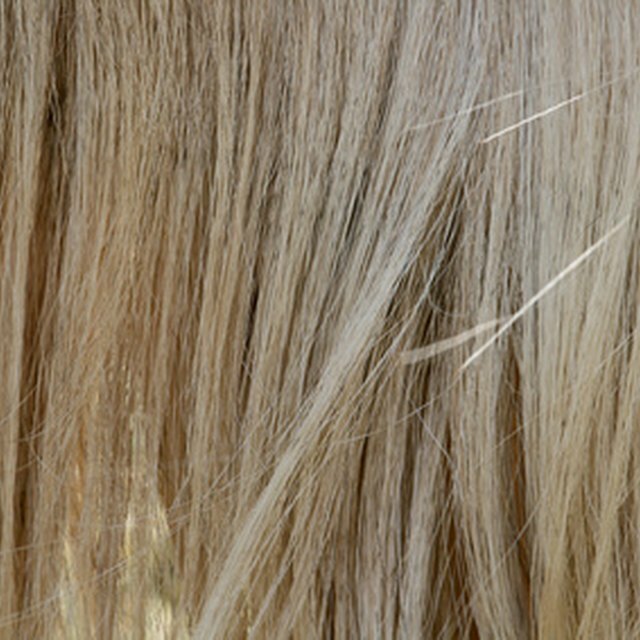 Processing blond hair can damage hair over time, which is something to consider, especially if your hair is not so healthy to begin with.